Honda mothballs thousands of cars | What Car? 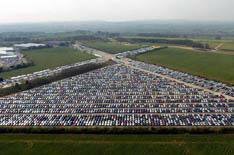 Honda has created a giant car park at Southampton docks, as the recession-hit company mothballs thousands of unsold cars. The manufacturer has been forced to rent extra space to park up to 8000 cars that have nowhere to go as car sales plummet. Honda has rented 20 acres of storage at Southampton docks, but has provision to store a further 7000 Civics and CR-Vs at a nearby former RAF airfield. A sharp decline in sales has forced the company to halt production during February and March at its nearby plant in South Marston, Wiltshire. Honda experienced a drop in sales during 2008 of almost 21%.